The white lion is occasionally found in wildlife reserves in South Africa and is a rare color mutation of the Kruger subspecies of lion (Panthera leo krugeri). It has been perpetuated by selective breeding in zoos around the world. White lions are not a separate subspecies and they have never been common in the wild. Regarded as divine by locals, white lions first came to public attention in the 1970s in Chris McBride's book The White Lions of Timbavati. White cubs occasionally turn up among tawny lions in the Timbavati and Kruger National Park regions. Because the gene is recessive and is masked by the normal tawny colour, white lions remain rare in the wild and only occur when two lions carrying the mutant gene are mated together. The greatest population of white lions is in zoos where they are deliberately bred for color. The population of the white lion is unknown but the most recent count was in 2004 and 300 were alive. White lions are not albino lions. Instead, the white color is caused by a recessive gene known as chinchilla or color inhibitor. They vary from blonde through to near white some can also be red. This coloration gives white lions a distinct disadvantage in nature because they are highly visible. This gives them away to their prey and makes them an attractive target for hunters. According to Linda Tucker, in "Mystery of the White Lions - Children of the Sun God" they are bred in camps in South Africa as trophies for canned hunts. The chinchilla mutation, a recessive gene, in white lions gives them their unusual color. A similar gene also produces white tigers. White lions can therefore be selectively bred for zoos and animal shows. Such breeding involves inbreeding of close relatives and can result in inbreeding depression (genetic defects, reduced fertility and physical defects) although this has not yet been recorded in white lions in zoos as it has in white tigers. According to Tucker, white lions in canned hunt camps have been found to have hind-limb paralysis and serious heart defects, indicating a severe level of inbreeding involved in mass-production although they are rare in the wild. White lions were first recorded in 1928 and in the early 1940s. In 1959, a pride with two white cubs was seen near Tshokwane in Kruger National Park, but later vanished. Albino lions had been recorded in the area according to David Alderton's book "Wild Cats Of The World". In 1974, a light grey lion cub was born at Birmingham Zoo, Alabama. In 1975, two white cubs were seen at Timbavati Private Game Reserve, adjacent to Kruger National Park. Their story is detailed by Chris McBride in his book "The White Lions of Timbavati". The two cubs, Temba (Zulu for "hope") and Tombi ("girl") had a tawny brother called Vela ('surprise'). In 1976, a white female cub called Phuma ("to be out of the ordinary") was sighted in the Timbavati pride. She was killed by hunters when 2 years old and her skin was sold in a shop in the town of Sabi. In 1977, a 2 year old blonde lion was observed in the Central District. After Phuma was killed, Temba, Tombi and Vela (who carried the recessive white mutation) were taken to the National Zoo in Pretoria, South Africa. Temba sired several cubs and died in 1996. Tombi had a white cub in 1981, but it did not survive. Vela sired a litter, but it isn't known whether any of his lineage survive. The white lions in the Ouwehands Dierenpark (Netherlands) and a private South African Zoo appear to be from Temba, or possibly Vela, lines. A few other white or blonde cubs were born in Timbavati after Temba, Tombi and Vela were removed. One female lived for several years until being killed in a territorial fight in 1993. Since then, the chinchilla ("white" or "blonde") mutation seems to have been lost in the wild. Another white lion bloodline, possibly part of the Timbavati bloodline, comes from a white male captured in the Timbavati area in the late 1980s and kept by a private reserve. Temba has left descendants in captivity. A heterozygous tawny lion at Pretoria Zoo carries the mutation and could pass this on to his offspring. Two heterozygous tawny males from the Cincinnati Zoo are now at a private reserve in Africa. A white female and a heterozygous tawny male were sent to the Zoological Animal Reproduction Center in Indiana, USA. A second female was unfortunately killed in a fight with a white female while on loan to a zoo. In 1977, Johannesburg Zoo caught a heterozygous tawny male that had a white brother. This zoo claims to be the first to have bred white lions in captivity. Timba, an injured tawny lion from Timbavati, was taken to the zoo for medical treatment. He was believed to have the white gene and was bred to a captive female and then to one of his own daughters. This produced a white lioness called Bella in 1982 who later produced many white cubs. This bloodline is represented at zoos in Philadelphia, Toronto, China, Germany and Japan. An unrelated strain of white lions at Johannesburg's Rhino & Lion Nature Reserve was founded by an orphan or abandoned white cub called Thandile discovered in the wild in the park in 1999. Thandile has blue eyes, but is not albino. In 1998, a half-eaten white cub had been found in the Rhino and Lion Reserve. In 1979, three litters containing white lions were recorded in Kruger National Park. In March, a female lion with three white cubs was observed near Tshokwane. In September, three white cubs (from two different lionesses) were seen. Another litter of white female cubs was captured from Kruger National Park and treated for sarcoptic mange. A white lion was observed in the Umfolozi Game Reserve in Zululand. A white lion breeding program is currently underway at Inkwenkwezi Private Game Reserve in South Africa's Eastern Cape province. Four white lion cubs were born at the Papanack Park Zoo outside Ottawa, but did not remain white. A white cub was born at an African Lion Safari in Florida (date uncertain) but did not remain white. Sanbona Wildlife Reserve in the Western Cape of South Africa introduced a white lion couple to the vast reserve in 2003 with the vision of letting them roam free and wild. The female gave birth to 3 white cubs on 18 May 2004 while still acclimatising in a boma. During acclimatisation the family were fed only wild game and were not subjected to any interference from humans. They were released into the reserve 6 months later and by December 2004 they had made their first kill on their own. Continuous monitoring by the Wildlife Department at Sanbona has ensured their white lions are still wild, well and free. In May of 2007 four white lion cubs were born at Jurques Zoo in France. The cubs consisted of one male and three females. Each cub weighed approximately 1.5 kilograms (3.3 pounds) at birth, and all four were in good health. However, they had to be separated from their mother because she was not taking proper care of them. These cubs died on Monday 4 June, 2007. 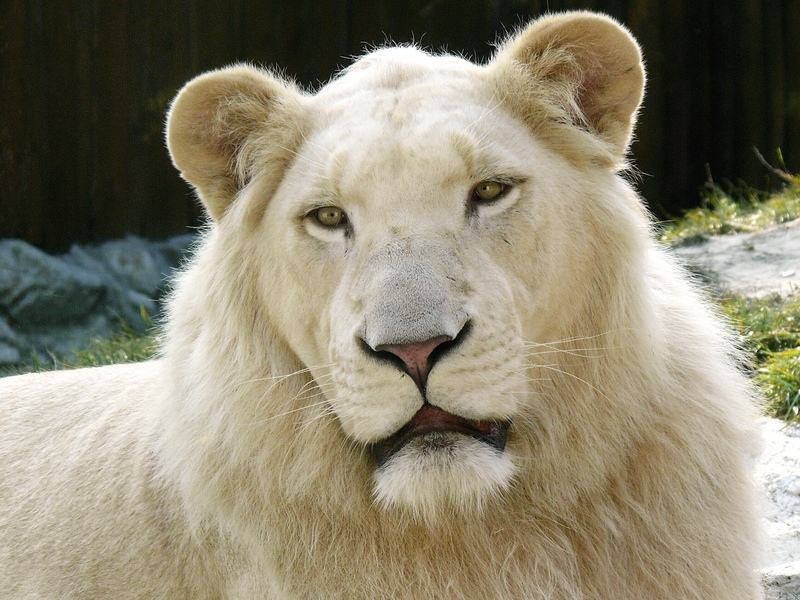 White lions are not albinos but are leucistic. They have pigment visible in the eyes (which may be the normal hazel or golden color, blue-gray or green-gray), paw pads and lips. Blue-eyed white lions exist and may be selectively bred. The leucistic trait is due to the chinchilla mutation that inhibits the deposition of pigment along the hair shaft, restricting it to the tips. The less pigment there is along the hair shaft, the paler the lion. As a result "white" lions range from blonde through to near white. The males have pale manes and tail tips instead of the usual dark tawny or black. The most famous example of the white lion is the anime character Kimba the White Lion, created by Osamu Tezuka. In the Dreamworks cartoon, Father of the Pride, Larry and his family are white lions and other white lions make appearances. In the Japanese anime Beast Wars II, the leader of the cybertron army Lio Convoy takes on the alternate form of a white lion. In the new documentary the life of a young White Lion Letsatsi in Africa. White Lion is a story about survival and friendship showing breathtaking immages of Africa's wildlife. The Michael Morpurgo book "The Butterfly Lion" concerns a character's relationship with a hand-reared white lion. In the Warhammer Fantasy Battle tabletop game, White Lions, warriors wearing the pelts of white lions, are a unit availiable to High Elves. lion lions... white lion... excellent!